The Victorian era of British history (1837 to 1901) was one of the more progressive eras in human history. I would have loved to live in this period of time, thanks to the numerous developments in society and technology popping up left and right. It was also a time known for great literature and theater. Oh, how I wish I could have experienced it! That said, it was also still ripe with weird, morbid traditions concerning death. Some of these are pretty disturbing. Proceed at your own risk. When someone died in Victorian England, women were forbidden to wear any jewelry while mourning. Instead, they wore a fossilized form of coal, known as lignite or jet. Talk about morbid. 2.) Hair of the Dead. After the first phase of mourning was finished, women were allowed to wear a single piece of jewelry. This piece of jewelry had to either contain, or be made of, the hair of the deceased loved one. This is just seriously gross. When someone died in a Victorian household, all the mirrors in the house had to be covered. I’m not quite sure what this accomplished, but it was believed that if a mirror fell and broke, death was coming soon for someone else in the house. Bodies also had to be removed from the house head first. This was to prevent them from beckoning others to follow it. Since Victorian medicine was not very advanced, people were always afraid of being buried alive. 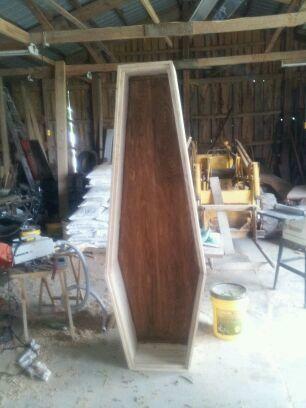 Enter the coffin alarm. It was a string that ran from the finger of the corpse up through the ground, to a bell on the headstone. I wonder if it actually worked. Death portraits were painted before the invention of the camera. During Victorian times, however, it became customary to have death photographs taken. I can’t imagine how creepy it was to pose for a photo with the body of your dead loved one. 6.) Making the Dead Look Alive. Death portraits existed to have something to remember the deceased by. To achieve this, photographers tried to make the dead look as alive as possible. This extremely creepy practice involved posing the body, having them hold their favorite object, and/or propping open their eyes. 7.) Mourning Veils and Bonnets. Widows traditionally wore a heavy bonnet and veil for the first three months of mourning. After three months, they could do away with the veil, but still had to wear the bonnet for another nine months. Some widows wore what was called widow’s weeds, another form of mourning dress, for up to two years after their husband’s death. I take back what I said about wanting to live in the Victorian Era. They were just too darn morbid. I don’t think I could ever pose with a dead body for a photograph. Disturbing Bonus Link: What Victorian Mothers Did With Their Babies. OMG.